Superintendent Bryan Luizzi talks to parents about how the school system is handling state budget cuts at the library in New Canaan, CT on April 20, 2017. NEW CANAAN — Uncertainty is in the air: In Hartford, over the state budget, in New Canaan over where this budget could hit schools and with parents as the town faces a nearly $4.2 million bill for teacher pensions, as well as cuts to state and special education grants. However, with the state budget still uncertain, the district could only speculate as to where the schools’ $87.6 million budget could be hit. Luizzi said as of now, the district is not planning anything and would be able to get through the next year on savings, if the proposed budget passed. As of April 25, key committee leaders spoke out against Gov. Dannel P. Malloy’s plan and proposed a new plan that would keep the state funding the same for the next two years. 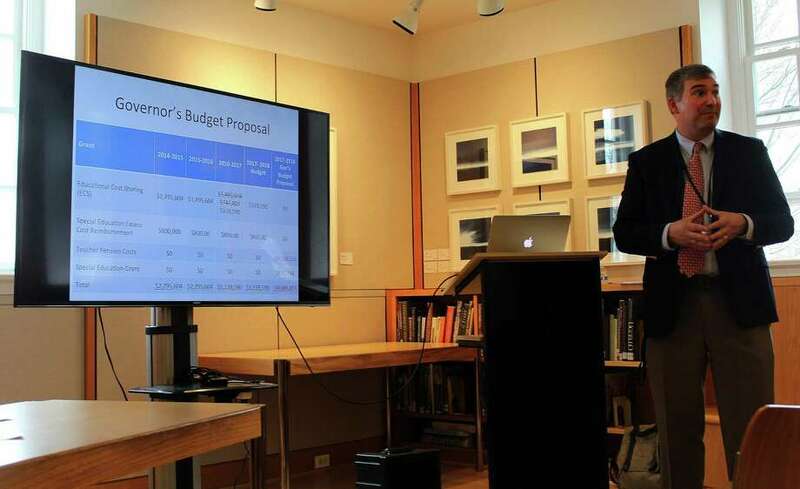 Under the current proposed budget, New Canaan is facing a $339,000 loss in educational cost sharing, $116,000 loss in special education grants and a $800,000 loss in special education excess cost reimbursement where the state pays back 70 percent of the cost for any special education student who requires more than 4.5 times the average student budget. Iin New Canaan, this comes out to compensation for students who require more than $100,000 for their yearly education. In addition, the district would have to pay $4.2 million in teacher pensions. Luizzi said higher pensions are the result of higher salaries which the state is trying to shift the burden to over to the district. Luizzi also said he’s been working with the town council to determine that in the unlikely event the budget passes as is, the town has enough excess funds set aside to get through the 2017-2018 school year without adjustment. However, cuts would have to be made in coming years should the schools lose their state funding and have to start paying teacher’s pensions. The town council approved the school’s budget with a 3.66 percent increase over the previous fiscal year at the end of March. In wake of the cuts, Luizzi said the district is going to focus on their goal of sustaining excellence while also improving results. New Canaan has consistently ranked among the top districts in the country by the likes of Forbes Magazine and Niche.com, something Luizzi hopes to keep by adhering to goals set by the school board.